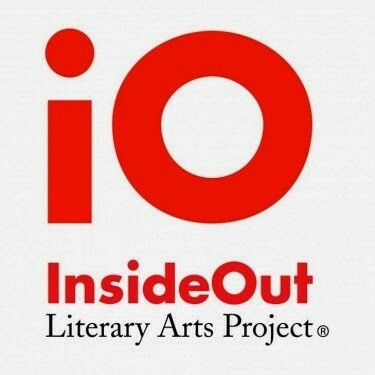 Recently, one of the writers teaching for InsideOut Literary Arts (iO) shared Kandinsky with second graders. It was more of a dialogue than a lesson, as the students were asked to write back to Kandinsky, to engage his painting through language. (Left to Right) Rev. G. Yusef Qualls (reading for his son Yusef Qualls–el), Lori Platt (reading for her cousin Jamie Laufenberg), and Demetric aka Shabazz Shakur (reading for his friend David Armstrong Jones). Video still by Katie Barkel. Image courtesy of the Hamtramck Free School. 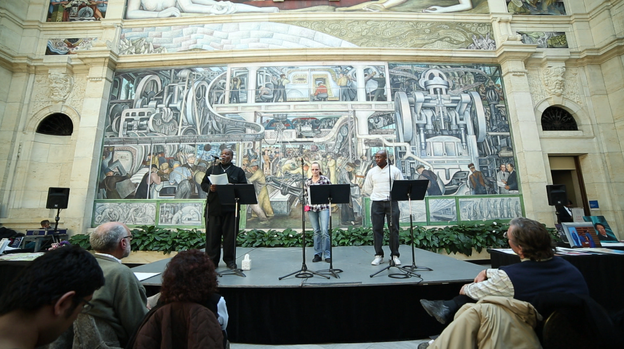 In late February, poetry traveled from the prison to the art museum. The Writer’s Block, a poetry workshop held at the Macomb Correctional Facility, hosted a poetry reading at the Detroit Institute of Arts. The Writer’s Block has a long history; most recently, the workshop partnered with the Hamtramck Free School, an arts organization that embraces free learning and interaction between peers. Bordering Detroit to the northeast is the city of Oak Park. In the middle of Oak Park is Lincoln Shopping Center, a nondescript suburban strip mall, the kind that typically houses a Family Dollar, a liquor store, maybe a restaurant. Lincoln Center is also home to the Book Beat, an independent bookshop owned by Cary Loren. Like most great bookshops, Book Beat’s shelves are crowded and distracting, spilling onto the floor and crowding the aisles. Their offerings are wide-ranging, from art photography to New York Times best-selling fiction, but without any of the middling blandness that characterizes the big box corporate store. Book Beat feels serious and yet welcoming. 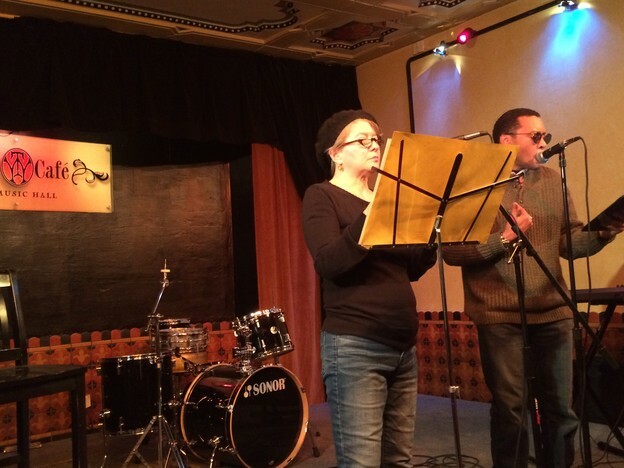 My first encounter with a Detroit poetry institution was the Woodward Line Poetry series, a monthly reading at the Scarab Club in Midtown organized by James Hart III and Kim Hunter. 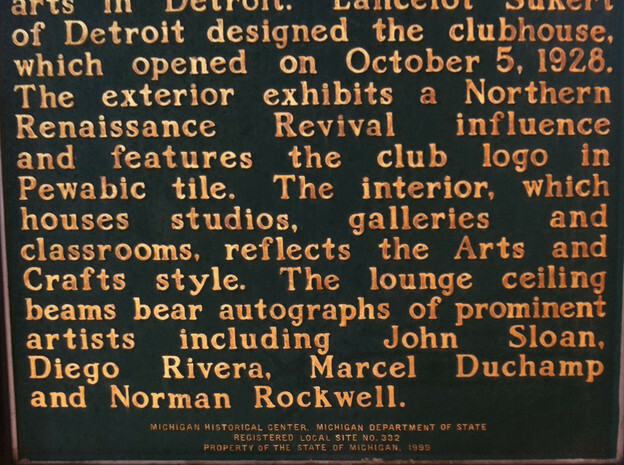 The series has been running for over 10 years, featuring poets from within and beyond Detroit. I first attended the Woodward Line back in September, when Nathaniel Mackey opened the 2014-15 series. The January 2015 reading featured two Detroit writers, Steve Hughes and James LaCroix, and a Windsor, Ontario writer, Gustave Morin. Snow had fallen all day, so the crowd was initially sparse.